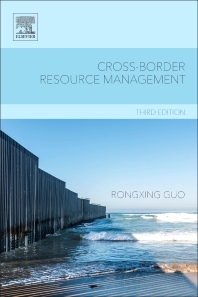 Cross-Border Resource Management, Third Edition covers theoretical and analytical issues relating to cross-border resource management. This book holistically explores issues when two entities share a border, such as sovereign countries, dependent states and others, where each seeks to maximize their political and economic interests regardless of impacts on the environment. This new edition has been completely revised to reflect current issues, with new cases from North America and Europe and discussions and issues regarding air and space. Users will find a single resource that explores the many facets of managing and utilizing natural resources when they extend across defined borders. Rongxing Guo has served with the OECD in Paris and at the Brookings Institute in Washington, DC. He has taught at the Australian National University, the China University of Mining and Technology, and Korea University, and Gakushuin University in Tokyo. He has an Amazon author's page.